We all know this verse; we hear it in lectures or during fundraisers, quoted alongside appeals for aid in international crises, whispered in the backs of our minds as we are tossing all of our ratty old clothes that we no longer want into the donation bin. We all know it, and we all know how hard it is to truly practice it. I am a self-professed “giver.” In reflecting on this verse, however, I am coming to realize that perhaps I can only say that I enjoy giving, because I only give away what is comfortable to me. I am not overly attached to my clothing, and giving small amounts of money, food, or even help, all come naturally. But how would I react if someone came by looking for something from my beloved book collection? Probably not so hospitably. There are as many different beloved things as there are individuals in this ummah. Some of us love our possessions for sentimental reasons, for the memories they carry. Some love the things that they have spent so much time making with their own efforts; some love those things that have already cost them a lot of money to buy. Some of us have more love for immaterial things: our time, our abilities, our talents, our knowledge, or our passion. It is difficult to measure the benefit that these gifts can bring to others, so instead we focus on what could happen if we give them away—they could be tarnished by the outside world, they could be wasted, used wrongly, we may be criticised instead of receiving something as little as a thank you. It is difficult for us to give away any of these things, material or not, for many reasons. One reason that I have found to be the case in my own experience is apathy. In the age of consumerism, social media, 24 hour news sites and information readily available at our fingertips, it is easy to become desensitized to the situations of our Muslim brothers and sisters. Or the world in general. We are bombarded with hundreds of images of suffering all around the world and, to make matters worse, we communicate almost exclusively through our screens, making forming real human connections increasingly difficult. So how can we give in the way of Allah when we love dunya (or at least a part of it)? 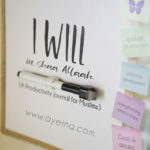 I’ve put together a few simple action steps that can put you on your way to giving in the way of Allah today, in shaa Allah. Although every good deed is charity in Islam, but following are some small specific things that are regarded as charity in ahadith (the reference links are either embedded in the text (purple underlined ones) or they are mentioned below or above the list). 15 – knowledge by which people benefit (it could be any beneficial knowledge and the knowledge from which people can get the benefit of dunya and aakhirah both is even better). 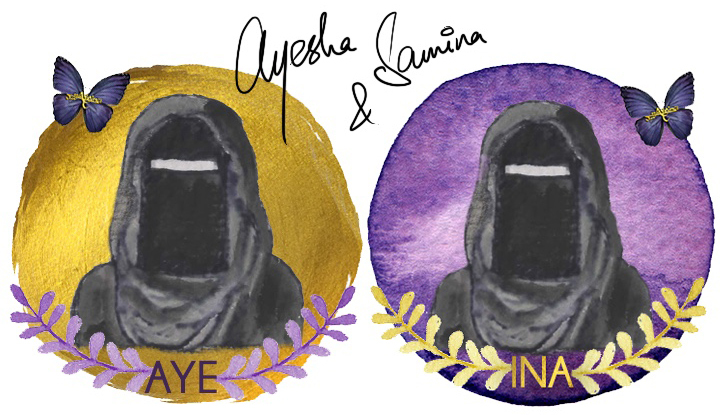 These are lasting investments in our aakhirah, and one that can produce so many rewards, even when we are no longer on this earth in shaa Allah. All can be counted as charity for us, without ever spending any of our money and hardly even impacting our day-to-day lives. All are reward-able acts if done for the sake of Allah (SWT) with a pure intention in the heart. 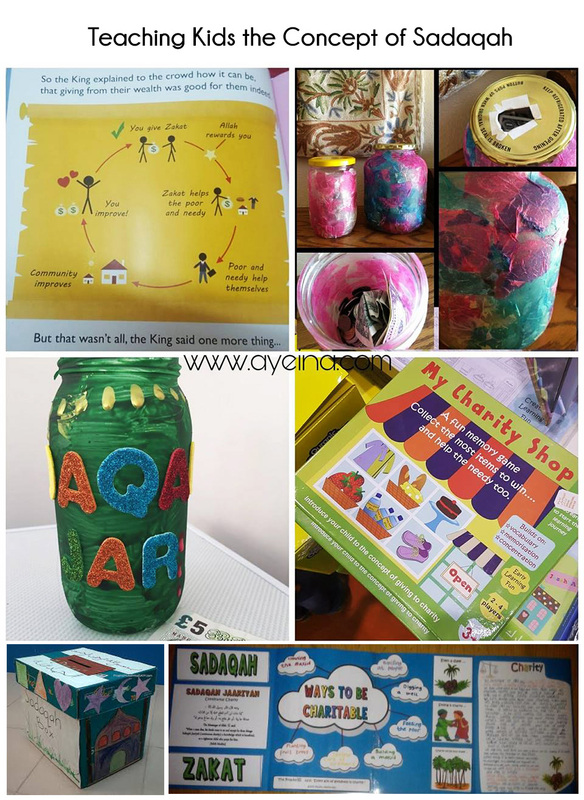 CREDITS: Zakat Tale (book by Ilyas & Duck), Decoupage Charity Jar by Little Life of Mine, Sadaqah Jar by Muslim Mummy, My Charity Shop by Smart Ark, Sadaqah Box, Zakat Chart for Kids by Iman’s Homeschool. 1) Volunteer at a charity event with your kids by your side. 2) Let your kids pick out toys/clothes/sweets etc. for giving. For eg: for orphans or kids in the mosque etc. on special occasions like Eid or all year round even! But on special occasions, your child can help shop for someone else, instead of just focusing on what they want to receive. 3) Let kids give from their own hands even if the material/money is yours. For eg: Keep granola bars in your car or bag and give to your child so they can hand it over to the homeless, or let kids take a meal to a sick neighbor etc. 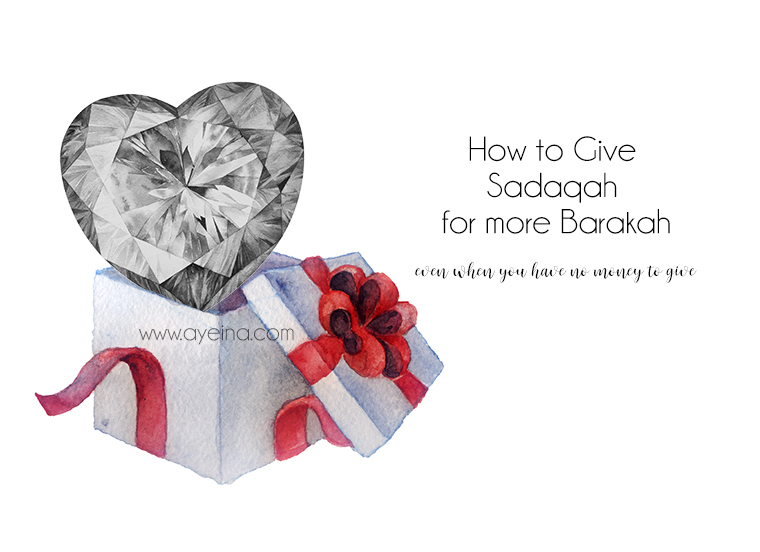 4) Create sadaqah jars, boxes or envelopes etc. with your child which also doubles as a fun craft activity. 5) Read children’s books/stories/charts about giving/sharing/generosity etc. 6) Teach them the five basic pillars of Islam through games/toys/activities etc. 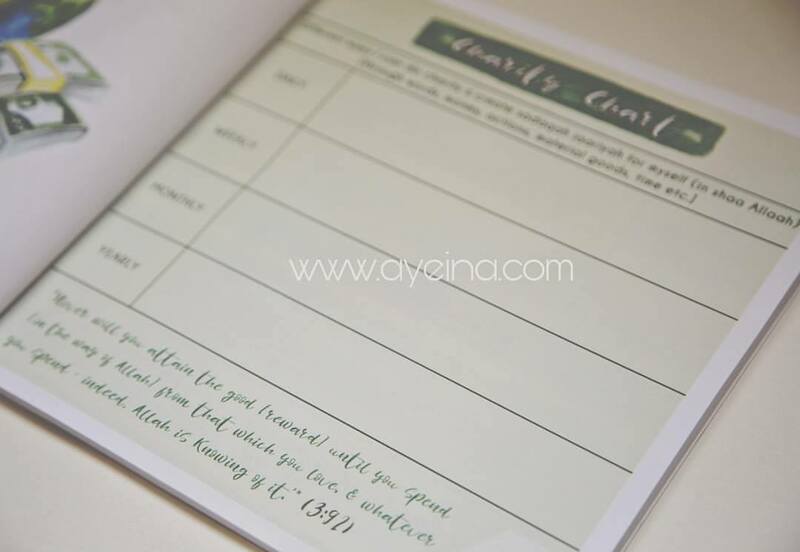 7) If they are old enough, they can actually fill out the productivity journal charity chart and benefit from the points given below too in shaa Allah! As I mentioned in the last section, there is so much more to giving than money. It can be the smallest actions in our everyday lives, but there are also so many things that we can give that we don’t even think about. One of these is our time and, most importantly, our skills. Everybody is good at something, and there are probably many non-profits that are looking for skills that you have. Non-profits often need people more than they need money, and just a couple hours a week of your time can go a long way. It doesn’t have to all be hard work either. I enjoy crocheting, and cancer is a cause near to my heart. So, during the autumn months I like to crochet a bunch of cute and warm hats that will keep chemo patients’ heads warm in the coming winter, and donate them to my local chemotherapy centers. It doesn’t take much time, and it is a hobby that I would pursue anyhow, so why not earn some good deeds from it? Most of us have some type of hobby, think of how yours can be used for the benefit of the community! The final thing that I wanted to mention here is another one that many of us do not think about: donating our blood. With fewer blood drives being held during the winter months, blood donations tend to drop this time of year. But the need for blood remains steady; donated blood has a shelf life of only 42 days. All blood types are wanted, especially type O or AB. Whatever you give, you will get it back multiplied in the aakhirah; it’s like savings for your journey towards jannah in shaa Allah. We are so quick to save all our pennies in a jar, direct our pay checks into our bank accounts, and stash any extra in our savings. But giving in charity is like making a transfer of funds from our dunya account to our aakhirah account—when we give, it isn’t actually leaving us, it is just going into an account that we cannot access until the Day when we will REALLY need it. Allah (SWT) doesn’t need our money or even our worship, it is us who are completely needy of it for our future in this world and the next. As mentioned above, we need to make the shift in our thinking to remind ourselves that by giving we are not actually decreasing from our own wealth, it is just changing form. Another thing that we can reflect on is how great of a blessing it is to us in the first place that we are in a position to give. Allah (SWT) has given us not only what we need, but an excess, and He has made us a means of relieving another person’s sufferings. As Muslims we are commanded to strive for excellence in all of our deeds and actions, and we should especially keep this in mind in situations where we are dealing with others, whether they be Muslims or non-Muslims. It is up to each one of us to show the most beautiful aspects of our deen, and what better way than to give to others in a most beautiful way? Lastly, many of us feel like we don’t actually have enough for ourselves, let alone to give away. If I give, then I will become poor. If I give, I won’t be able to afford my car payments. If I give, how will I pay for my kids’ education? And on and on. If we let this mindset dominate our lives, it will remain unchanged no matter how much money we make or how much we have saved up in the bank. How much would it really cost us to buy the homeless guy next to our favorite cafe a drink or sandwich as we grab our morning coffee? How much would it really impact our finances to cut out the unnecessary expenses and instead direct that money to a worthy cause? Even if we do not have extra cash or possessions to give – we always have our time, our talents and our knowledge. According to Research (Psychology Today): Giving makes us far happier than receiving. Thus, in a way, we are actually being both selfish and selfless by giving to others. Numerous studies have shown that giving to others or to charity will put a much bigger smile on your face than spending on yourself. One way I like to think of giving in charity is like buying a gift. Think of what goes into buying a gift for a friend or loved one; we spend hours looking for just the perfect thing, and will probably even spend a bit of extra money just to see the joy on their face when they see it. If we can infuse our sadaqah with that very same love, care, and thoughtfulness of gift-giving, imagine the impact that it can have on those we give to. We need to let this verse serve as our reminder and our wake up call to make a very drastic mindset shift in the way we see the life of this world. In today’s society everything is about me, me, me and mine, mine, mine, but what we don’t realize is that Allah (SWT) is the One Who gave us every single thing we have, from the smallest tips of our fingernails to that nice car we got last year. When we start to look at the things of the dunya as a loan from Allah (SWT), we will be much quicker to discharge that loan in the most beautiful way possible, by giving it to those more in need than us. The true believers are those who realize that even our own lives belong to Allah (SWT) and every single thing that we are blessed with comes from Him alone, and one day they all will certainly be returning to Him. Along with reminding ourselves that everything we have is from Allah (SWT), it is beneficial to also remember how fleeting this life is. Think back to the times when you didn’t have the resources you do now. You probably couldn’t even imagine having what you do today, it was a far-off, distant dream. 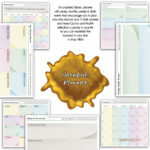 Perhaps where you are in your life right now has even surpassed your ideas and plans from the past, and you are in a place you could have never even dreamed of.What’s more, we never know when our circumstances are going to change. Even though your hand is the one giving today, tomorrow it may be the one taking…Always remember that this life goes through seasons, and that hoarding what you love will not necessarily guarantee that you will have any of that in the future. Co-author’s Bio: Ashley is a writer, revert, tea-drinker, cat-lover, and passionate life-liver. 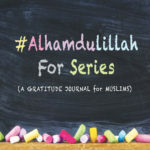 You can find her blog at www.muslimahaccordingtome.wordpress.com, where she shares inspiration and encouragement for Muslim women on their individual spiritual journeys.